Not to worry, it is only the last Lindemann recital for this season; we have every reason to believe that this valuable program will survive any cuts in governmental funding. We have often written about the value of this partnership between The Metropolitan Opera and The Juilliard School. The young artists chosen for this program get access to the resources of both institutions and performance opportunities aplenty. 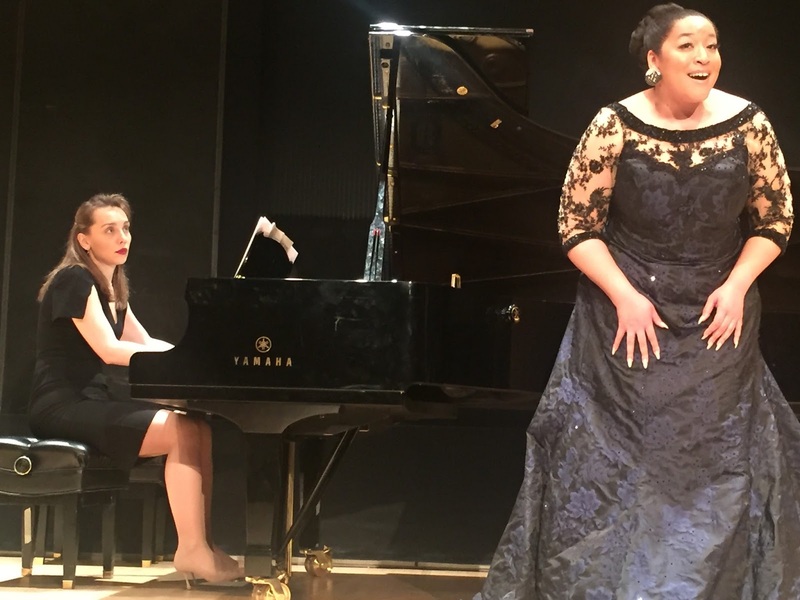 We have been observing the progress of these rising stars for some time and think of the Lindemann Program as a finishing school for opera singers. Of course, training never ends and even famous superstars take lessons! Last night's program included mezzo-soprano Virginie Verrez, bass Sava Vemic, soprano Michelle Bradley, and coloratura soprano Hyesang Park. They are all well known to us and have given us abundant musical delights over the past few years. Ms. Verrez, as a native speaker of French, was the perfect artist to perform Ravel's Sheherazade, which she translated herself. It truly does make a difference when a singer has that kind of in depth understanding of the text. In this cycle, Ravel's music captures the fantasy and eroticism of Tristan Klingsor's text. The poet was quite an armchair traveler! Ms. Verrez has an unassuming presence and does nothing to call attention to herself, but rather submerges herself into the music, allowing the listener to see through her eyes all the imagery of the song. Judicious word coloring paints an aural picture. It goes without saying that the voice is a magnificent one and the phrasing is just what one hopes for in chanson. Ms. Verrez is always a consummate musician. Her collaborative pianist Giuseppe Mentuccia did justice to the lavish accompaniment. In "Asie"; his fingers raced up and down the keys, adding to the air of exoticism. In the haunting postlude to "La flute enchantee", Ms. Verrez' absorption sustained the mood. We enjoyed the feeling of unfulfilled longing in "L'indifferent". Bass Sava Vemic chose a set of songs about death which he also translated himself. Schubert's "Der Tod und das Madchen" begins with some portentous chords in the piano expressing the fear of the young woman. The work gave Mr. Vemic the opportunity to sing in two different colors. In the second verse, Death reassures the maiden of his gentleness and the change of color was arresting. He had to dig down deep for a really really low note. Brahms' "O Tod, wie bitter bist du" also shows two sides of Death--bitter to some and welcome to others. Mr. Metuccia again provided fine collaboration on the piano with a rumbling accompaniment. In this song, the pairing of text and music was so apt that we could not imagine the work being sung in translation. Here Death is both seductive and comforting, blanketing an old peasant in snow. Soprano Michelle Bradley has a diva's presence and a large sound that thrills the ear. She performed Samuel Barber's Hermit Songs and performed them as mini-dramas that created the world of Irish monks and scholars. There is great variety in the text and consequently in the music. Ms. Bradley invested each with its own meaning. We particularly enjoyed the enthusiasm of "The Heavenly Banquet", the contentment of "The Monk and His Cat", and the knowing wink of "Promiscuity", the two lines of which Ms. Bradley invested with a world of meaning. She altered her vibrato to put an evocative chill into "The Desire for Hermitage" which closed the set. In this set the accompanist was Valeriya Polunina whom we have always admired for her ability to focus on the singer. The pair made a fine team. Sadly, due to a prior commitment, we had to take our leave before hearing Hyesang Park whom we absolutely adore. We wish we might have cloned ourself.